This is the schematic for the motor starter I built to power my 3-phase 2T22 from my single-phase 240VAC mains. This converter uses a capacitor to generate a voltage lagging out of phase with the mains. This is that same way most single-phase induction motors are started, and the setup below is particularly similar to the system used to start home air conditioner and refridgerator compressors. 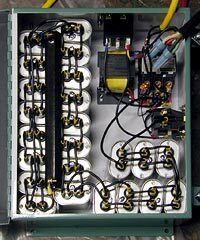 Once the motor is up to speed, the start capacitor is disconnected from the motor by a voltage sensing relay (an air conditioner part, Grainger 6X550 or 6X560). This method of starting 3-phase motors is not a true 3-phase converter, but is often referred to as a "static phase converter", somewhat erroneously. I used a tried-and-true design published here by George Carlson: http://web.wt.net/~hmsc/phconv/phconv.htm I added an additional contactor between the converter and siren, because the capacitors would otherwise pulse the motor erractically on spin-down, ruining the sound. 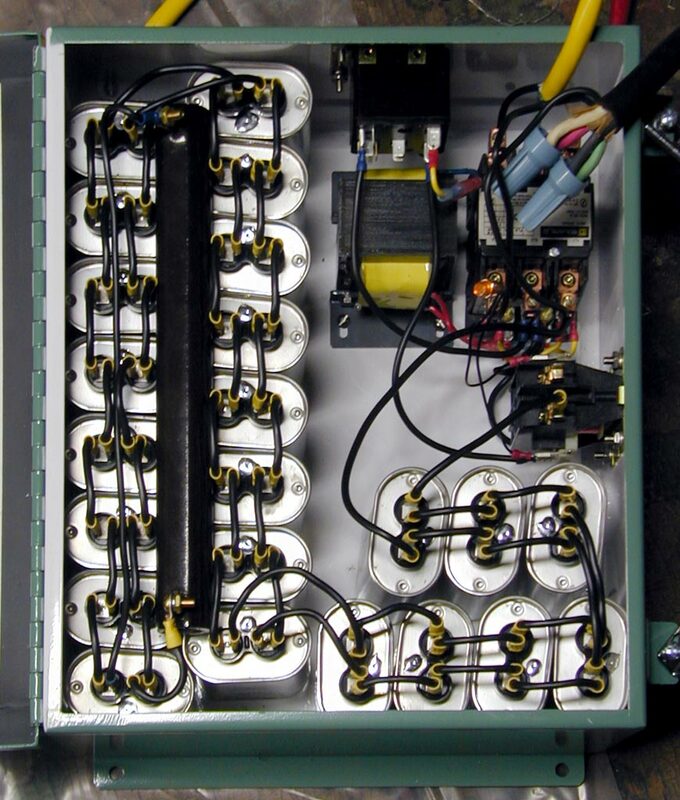 This style of static converter is available from Phase-a-matic, Ronk, GWM and others, but their commercially made units are not robust enough for siren duty, due to the use of cheap electrolytic start caps. The electrolytic start capacitors are designed for rapid and occasional starting of motors which do not start under heavy load. Sirens, however, have no choice but to start with a heavy inertial load, due to the nature of the heavy cast rotor. This means a comparitively long start up cycle, the duration of which often exceeds the rating of electrolytic motor start capacitors (3 seconds max rating). Furthermore, repeated starting and stopping of the siren for an attack wail greatly adds to the problem, since the capacitors have no time to cool off between starts. Motor start electrolytics will fail quickly under this stress, letting out their smoke with a loud bang. For these reasons, commercial phase converter companies recommend their rotary converter products. These work *great*, but they also cost a fortune and weigh a ton. I looked into getting a rotary to power my 2T22, and it would have been a 350 pound $2200 unit! Sigh. Ditto for using a large 3-phase motor as a converter... works great but the extra "transformer" motor has to be twice as big (in horsepower) as the siren motor, or it will stall. Again, not an option. My compromise was to overcome the Achilles Heel of the static converter, namely, to replace the cheap capacitors with ones rated for continuous duty. Oil-filled MPPF (Metalized Polypropylene Film) motor-run capacitors seemed ideal for this. They cost a hundred times more than electrolytics per microfarad, but they are also available on the surplus market at a large discount from commercial cost. I got a lot of 40 b-stock 52µF capacitors on ebay for $150, and ended up using 27 of them. They work great, though they need a lot more space than the equivalent amount of electrolytic capacitance. This was not a problem, I just got a large enough enclosure (14" x 16" x 6").